A little over two years ago I met up with Pete Hill, who at that point was the Senior Product Designer for Lowepro. During our meeting he asked me, “What product are we not making that you would like to see?” It wasn’t an easy question to answer since LowePro makes more styles of camera bags than any other camera bag manufacturer on Earth. After thinking about my needs and the crazy number of other Lowepro bags I already own, I suggested that Lowepro create a backpack specifically for outdoor photographers. I described a pack that had a light, comfortable backpacking style suspension, easy access to the camera gear, and room for additional outdoor gear that we outdoor photographers have to carry with us on photo shoots. A few months ago, I got a call from the marketing department at Lowepro asking if I would like to test out their new photo backpack, the Rover Pro 45L AW. I have a long standing working relationship with Lowepro and of course I said yes when they asked me to test out the new pack. The Rover Pro 45L AW is basically the pack I asked for and I have to say it is great to see a concept come to fruition. Above Image: On the hike in I paused for a moment to take in the view. My good friend and phenomenal photographer Marc Romanelli snapped this image of me wearing the new Lowepro Rover Pro 45L AW. Image Copyright © Marc Romanelli. I have used the Rover Pro on a few photo shoots over the last few weeks and it has proven to be a very comfortable, lightweight backpack that can haul a serious amount of gear. In the images above and below, I am using the Lowepro Rover Pro 45L AW photo backpack on a rock climbing shoot in Diablo Canyon near Santa Fe, New Mexico. 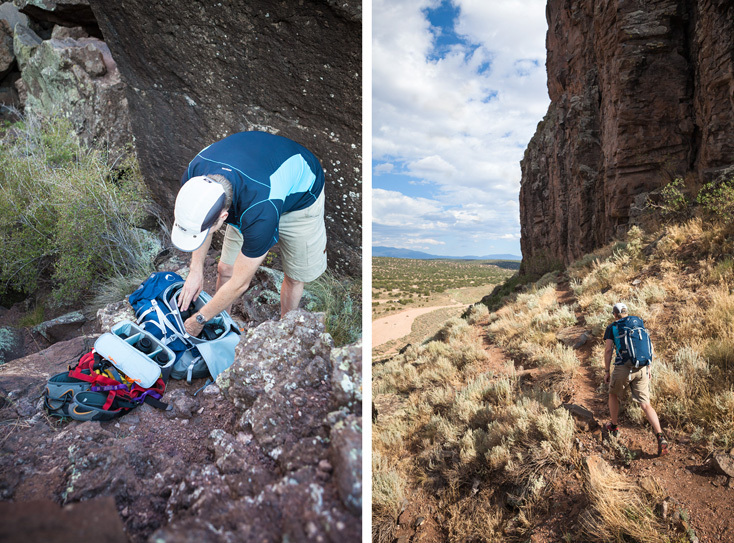 For this shoot, I had over 60 pounds of climbing and photo gear loaded into the backpack. I am not sure what the recommended maximum load for this pack is but I have a feeling I was very near to it or slightly over it. Regardless, the pack still carried quite well and was comfortable. The pack is a 45-liter pack (hence 45L in the name) and it also includes two modular equipment cases for storing your camera equipment safely in the backpack. The modular cases are heavily padded, which is key, so that the rest of your outdoor gear doesn’t injure your camera equipment. Once at the location, you can access your camera gear by zipping open the large flap on the outside of the pack (as in the left image below). This isn’t a pack for accessing your gear “on the go” like some other Lowepro packs. This is a pack for getting your gear to a location where you can set up a home base and work out of the pack. Above left: After scrambling over huge boulders I found a place to set my pack. Since I wasn’t ever too far away from the pack it was easy to get back to it when I needed to change lenses or grab some more gear. Above right: Hiking with this pack is a breeze and it is quite durable as well. I made sure to scrape it up a bit while on this shoot. It wasn’t hard with all the scrambling and climbing I had to do to get into position. Amazingly, the pack showed no signs of wear whatsoever when I got back to the car. Both images Copyright © Marc Romanelli. Aside from the padded camera cases, Lowepro included some other smart design features in this pack. The first thing that catches your eye is the suspension system. In my experience, most camera backpacks, when fully loaded, feel like you are carrying a giant brick on your back. If you only have to carry those “giant bricks” a short distance then it isn’t too bad, but if you need to carry them any significant distance they can really make your back sore. The Rover Pro 45L AW has an anatomic back panel the fits the curve and shape of your back. The pack arches away from your back and has a mesh lining that lays against your back. Because the mesh back panel is a tricot fabric, it automatically adjusts to your back when you put the pack on. 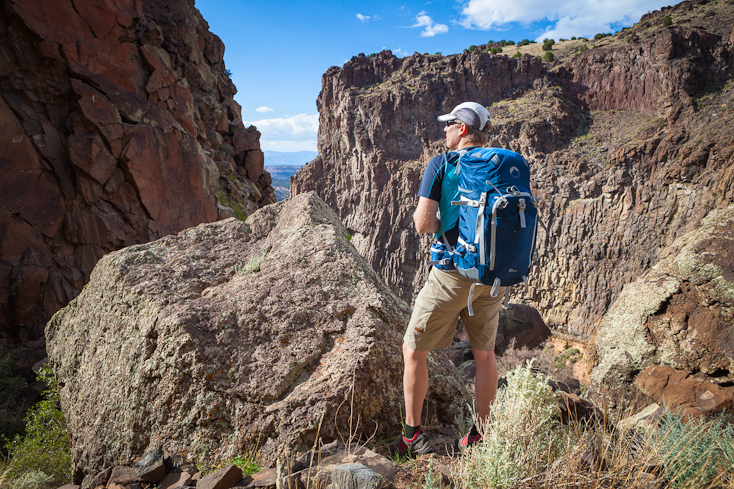 This suspension style is a common feature in backpacking packs these days and it also allows your sweat to evaporate away instead of being absorbed by the back panel. There is also a U-shaped aluminum rod built into the back panel that forms the actual suspension system. Maybe one of the best features of the Rover Pro 45L AW is that the shoulder straps and the torso length are adjustable so that you can custom fit the Rover Pro to your back length. This is one of my biggest issues with all camera backpacks and I asked very specifically for an adjustable torso length when I met with the Lowepro designers. As a slightly taller than average person, who is 6’3″ and has a long 22.5-inch back length, I have had a hard time finding any photo backpacks that fit my torso length. Finally, with this product we have a photo backpack that will fit just about anyone. As someone who has carried a lot of packs in the outdoors this feature is a key. In the same vein, the waist belt is also very well designed. It is well padded but is still lightweight and it incorporates a pulley system that makes cinching the waist belt tight a snap. The waist belt straps on my sample seemed ridiculously long but nonetheless they were very effective. The waist belt also has a seam running down the middle of it that allows the hip belt to cup your hips nicely. And just in case you didn’t think I was a gear head, that last sentence will confirm my nerd status when it comes to outdoor gear! Lastly, I like that the designers have added small pockets to the waist belt so I can stash energy bars and/or gels where I can get to them easily without having to take the pack off. The Rover Pro’s suspension, adjustable shoulder straps and the ample hip belt all conspire to make it the most comfortable photo backpack I have tried yet. Above you can see some studio shots of the pack and how the padded camera cases pull out of the front zippered flap. As you an see the two cases take up about two-thirds of the pack, but of course you don’t necessarily have to use both padded pouches on every trip. The last image (on the right) shows how gear can be packed into the pouches. You can pack a fair amount of photo gear into these pouches. These three images were provided by Lowepro and are used here with their permission. The pack has plenty of exterior straps and buckles as well. There are places to attach extra gear, a tripod and also a pocket on the side of the pack to put your Camelbak (or similar) hydration system. As someone who has had water bottles and hydration systems leak into my packs I really appreciate the thought that went into this pack and especially the hydration pocket being on the side of the pack. There is even a little nylon strap inside the hydration pocket to hold your Camelbak in place. The camera gear sits right on top of where the hydration system would normally go so this solves the problem of having a lot of heavy camera gear pressuring your hydration system. The pack is fairly lightweight for what it is. With the padded camera cases the pack weighs in at approximately 2,800 grams (6 lbs 3 ounces), which is a full two-pounds lighter than my next favorite photo backpack—the Lowepro Vertex 300 AW. At just over six pounds the Rover Pro isn’t going to impress an ultralight backpacker necessarily, but considering I just carried 60+ pounds in this pack and it still felt comfortable, and carried my camera gear with ease, the weight of the pack is not too shabby. Of course, if Lowepro wanted to make a lighter weight version of this pack they could easily remove some of the extra fabric on the sides of the pack and also use a lighter weight pack fabric. The pack also includes a full “All-Weather” (AW) rain cover that nicely zips into a pocket on the bottom of the pack. I have tested the AW covers extensively on other LowePro products and can vouch that they work extremely well. The last thing I will mention here is that the pack even has ice axe loops, which may seem crazy for most photographers, but for the adventure photographer it means I can take this pack on an ice climbing photo shoot and strap my axes on the pack. The image below shows everything that I carried in the Rover Pro on this rock climbing photo shoot and below the image is a caption detailing the items. Even though the pack looks a little small in some of these images this shows that it can haul a considerable amount of gear. Items that I put into the Lowepro Rover Pro 45L AW for this rock climbing shoot: 1 – Rover Pro 45L AW pack, 2 – Lightweight windbreaker jacket, 3 – Misc. climbing gear including carabiners, quickdraws and slings, 4 – Camelbak hydration bag, 5 – Large padded modular camera pouch. I put my Nikon D4, a Nikkor 70-200mm f/2.8G VR II lens, an extra battery, a memory card wallet and a few other small items in this pouch, 6 – Small padded modular camera pouch. In this pouch I had a Hoodman loupe, a Nikkor 14-24mm f/2.8 lens and a Nikkor 24-70mm f/2.8G lens, 7 – Knee Pads, 8 – Energy Bars, 9 – Headlamp, 10 – Fleece vest, 11 – Climbing harness, 12 – Static Rope (for hanging above the climber), 13 – Rope protector, 14 – Ascenders and etriers (For use with the static rope to get above the climber). And though they are not pictured here, I also had my wallet, iPhone and keys stashed in the top pocket as well. Of course, every first generation product can be improved and while the Rover Pro is excellent as is, there are a few small changes that could make the pack even better. First, the top lid is sewn to the top of the pack, which doesn’t allow you to overstuff the pack. It isn’t a huge deal, but there are certainly those times when you want to throw in an extra jacket or gear and it is an easy fix to just attach the top lid with some sort of adjustable buckle. Second, while the camera cases are well done, they aren’t very useful on their own. It would be great to see Lowepro make the cases more versatile so that you could pull one out and use it as a fanny pack with a built-in or modular waistbelt. Lastly, while I could fit a decent amount of gear into the pack it would be nice to see a slightly larger version of the pack for those shoots where I need to take bulkier outdoor items like down jackets and such. This last item isn’t so much a critique of this pack, maybe just a note for LowePro to make a larger version of this pack like they do with their other photo backpacks. The Verdict: If you are an outdoor or adventure sports photographer then this pack is a no-brainer. It can carry plenty of camera gear and a substantial amount of outdoor gear—and it is a comfortable pack. This is yet another excellent product from Lowepro. I will certainly be using it on my photo shoots where I need to haul photo equipment and outdoor gear into the backcountry. Not to be overshadowed by the new backpack, the entire point of this last excursion was to photograph some rock climbing. And as you can see below, I did just that. My thanks to Aaron Miller and Amy Jordan for coming out and working with me on this photo shoot in Diablo Canyon. In the images below Aaron is climbing a route named Crystal Clear Arete, which is rated 5.12c. It is a fairly steep and difficult route—and as you can see it is also quite photogenic. I photographed Aaron on the route from above and from the side by hiking up the canyon to a position that is level with the midpoint of the route. I chose this route because it is so easy to shoot from the side and because it gets great afternoon light. The hike up to this route is also quite rugged and provided a good test for the Rover Pro. To photograph Aaron from above, I set up a rope on the anchors of the climb and used ascenders to climb the static line. The ascenders, as you can see in the image below, allow me to let go and concentrate on photographing the climb and the climber. Shooting rock climbing from above is hard work and requires that the climber and the photographer work together to get the best images. Above: Here I am hanging on a static rope from my ascenders, which use a camming mechanism to clamp down on the rope and hold me in place. I shot with a Nikkor 24-70mm f/2.8 lens on my Nikon D4. Having shot the route from the side, and having shot this route before, I knew the best images would be in this section just above the small overhang. Hence, I positioned myself about fifteen feet above this part of the climb. As Aaron climbed up to my position I moved up the route with him. Image Copyright © Marc Romanelli. My thanks to Marc Romanelli who came out with me on this photo shoot and provided images of me using the pack for this blog post. Also, my thanks to Lowepro for allowing me to test out this new backpack and for their continued support. If you would like more information about the Rover Pro 45L AW visit the Lowepro website. For more equipment reviews please check out back issues of the Michael Clark Photography Newsletter. If you would like to subscribe to the Newsletter please send me an email and I will add you to the mailing list. willie miller - look like it will be a good bag for ererything i do i take that back this backpack is just what i need for traveling .keep going..lowepro. Martin - Great review — looks perfect. I modified a Deuter daypack to do just this, but like these specs better — especially if the water bladder is on the side, and not crushed under all the camera gear. John morris - How does it stack up against the F-Stop Loka? Michael Clark - John – I don’t know how it stacks up against the F-Stop Loka or any of the F-Stop bags. I have never seen any of their bags so I can’t say. The F-Stop bags look very nice though they are also quite a bit more expensive.